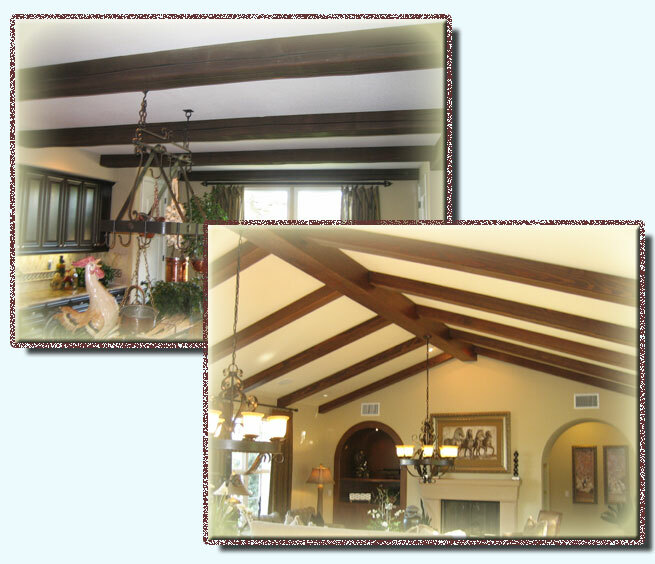 These decorative beams definitely look real and feel real but they are not. They are made of polyurethane and are textured and stained to look just like wood. These Faux wood beams posses the texture and and wood grain as real wood. Our beams come as long as 20' and will fit almost any size room without having to seam 2 beams together. We can paint and stain them in verity of colors to match almost any wood interior. Check out our design idea gallery- next page. Before you choose and decide on faux beams installation you should check and remember that "Not all beams are created equal", Our beams are of the best quality. Some beams just don't look as real, (depending on the manufacturer). Our beams are the closest that can be in color texture,shape and size.